T-Mobile Coverage:Poor. Could receive text messages and voicemail notifications but couldn't make calls or send messages. Seemed common among all carriers. There is one spot at the northwest corner of the FAA fence that seems to get okay coverage that may work. This is a fun event made even more enjoyable by the addition of a few friends. 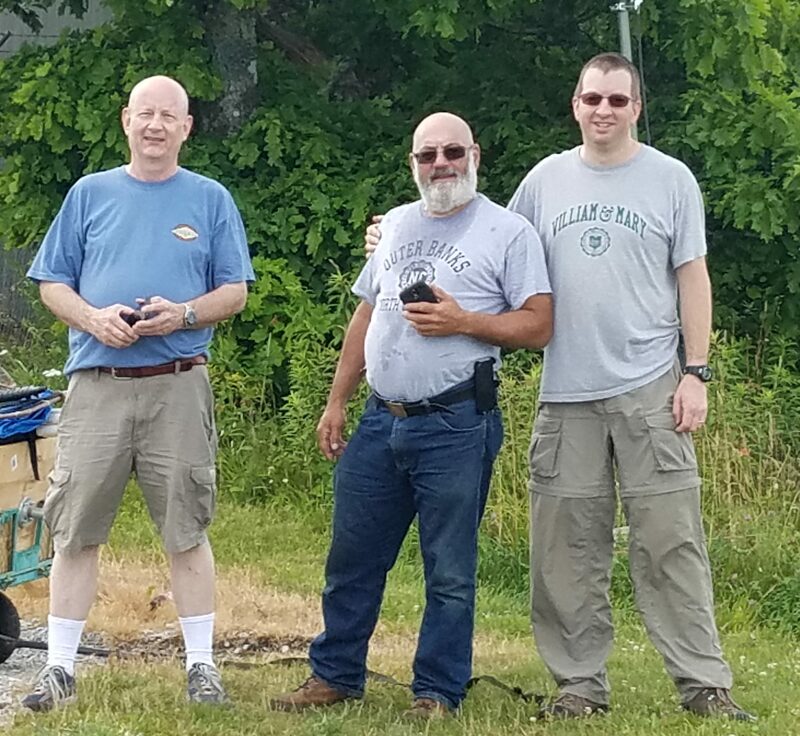 This year, like last year, I was joined by Dave KB3RAN and Steve N3IPN. A new member of the group, Ed KC3EN, also joined us this year, and I hope will continue to be part of the team. Since we're so far away (about a 5 hour drive) we camped at the Peaks of the Otter Campground, the night before, which is a few miles south of Apple Orchard Mountain. The campground is nice and wasn't crowded. We were able to get two sites that were adjacent allowing us to put up two tents and have the RV all together. Steve, and his excellent fire-building skills, had a roaring fire going in no time, and pork chops were our first meal of the trip. Overnight rain kept me in a tent and out of my hammock that I've been sleeping in as of late, so that was kind of a bummer. At least we missed the torrential rainfall that hit the area earlier in the day. I don't think I touched on this subject last year, probably because I was still sore (physically and emotionally) about the situation. For this year's readers I'll do a recap. Last year was our first year supporting the APRS Golden Packet event. It was also our first time ever going atop Apple Orchard Mountain. While we had looked at maps and measured distances and altitude changes we really hadn't grasped the energy it would take to get two overloaded wagons up the mountain. For the record, the distance up the road is .6 mi and the elevation change is just over 300 feet. But last year the two wagons of gear were likely weighing in excess of 2 tons each (metric, imperial, royal... your pick). This year we scaled back enormously. Batteries and antenna masts were reduced and lightened. Radio and antennas were lessened. Oh, and we added another mule to the team (thanks Ed!). This year we made it up to the summit muchfaster than last year. The primary mission of this trip was to activate an APRS digipeater on Apple Orchard Mountain in support of the APRS Golden Packet event. 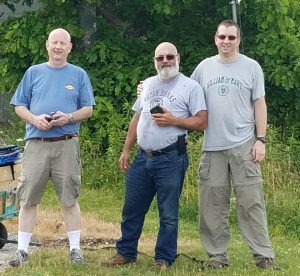 The event takes place annually and takes fifteen teams from Springer Mountain in Georgia to Katahdyn in Maine to build and maintain a network of VHF digipeaters so that a golden packet may be passed from Georgia to Maine and back. 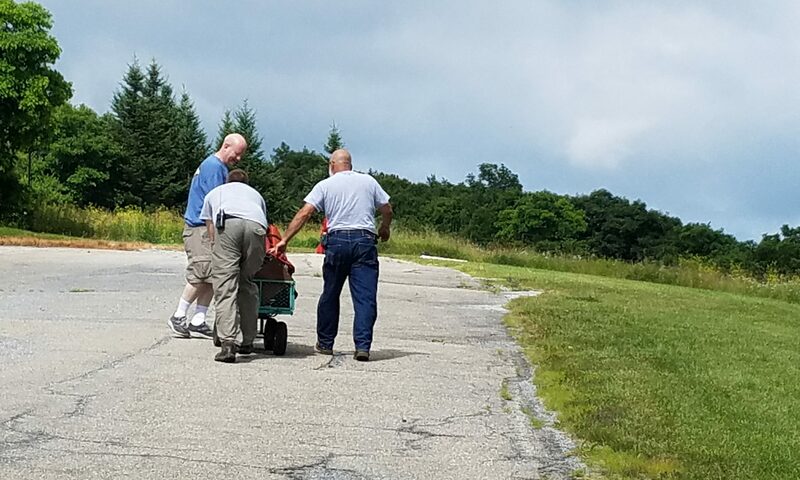 Last year we completed our portion of the mission but there were problems along the link (equipment and personnel) that caused a failure. What parts we did get active worked well and we tested both 1200 and 9600 baud links. This year we decided to do only 9600 baud links. Unfortunately I didn't realize that the link between us (AOMTN-5) and Hawksbill (HAWKBL-6) is quite fragile and a change in antenna made the path between us unusable for 9600 baud. Even 2m FM voice was tough going. Fortunately 1200 baud packet was able to get through, and everyone switching to 1200 baud allowed the entire network to connect and function. It wasn't too long after everyone switched to 1200 baud that news went out that the Golden Packet had been passed from Maine to Georgia and back so we were successful! Mission complete. In hind sight I should have probably walked our antenna around a bit to see if I could have found a better location while I had Hawksbill on VHF voice. Next year I want to bring a 2m/70cm yagi to direct my power to where I want it to go instead of just having it fly all over the place. I'm also hoping to venture back out to Apple Orchard Mountain, before next July, and test comms with Hawksbill if I can get time and another team on the distant end. It's a haul to get up to the top of Apple Orchard Mountain. At least the road is paved, though. Of course we're not going to go up there with only a TM-D700 and call it a day; no, we brought stuff! 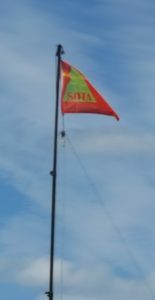 I believe there were five HF/VHF+ transceivers that made the trip with several antennas, batteries, poles, tents, and other accouterments. 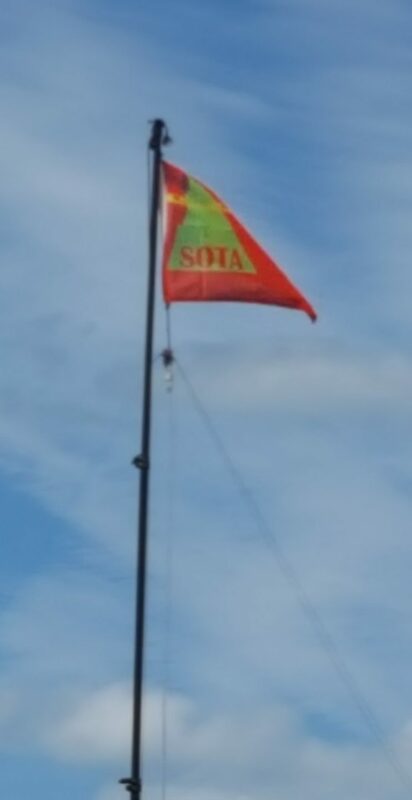 Like last year, we also decided to activate the summit for SOTA! I had 15 contacts, 13 states, have 4 eQsl confirmations already and maybe picked up VT as my 49th state. Dang, could have had DE and had a WAS but couldn't hear Bob Balint [KF3AA]. Steve also had problems last year but was busy scratching contacts onto his log while working a pile-up on 40m. He wanted to work 2m SSB but heard no one, which is unfortunate. I, too, tried listening on the lower portion of 2m and didn't hear squat which I found amazing from ~4200 feet. No beacons or chit chat of any kind. What was worse was the neighborhood RF seemed to be overloading the front end of my K1 making my Plan A QRP station completely inoperable. Thankfully I was able to borrow a 40m dipole for a few minutes and put a few contacts in the log using my FT-857D. 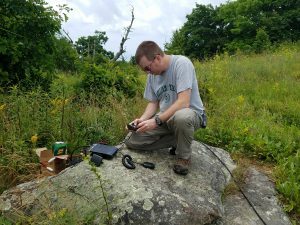 I was actually talking with W2SE on 40m when I had a duhmoment and grabbed the microphone on the D700 and called Comers Mountain and worked their crew for summit-to-summit (S2S) credit. Hawksbill had already closed down so I missed my opportunity there, unfortunately. In the end I managed 10 SOTA contacts which isn't too shabby. APRS worked really well from up on the summit. There was plenty of digipeater coverage below and that allowed us to send spots and communicate with others well. **APRS2SOTA** worked spectacularly! Being able to let the chasers know what frequencies were were operating on in real time via RF was priceless. It's easy to use, and I was able to interact with the service using only my D72 portable radio. PSK31. Dave left his tablet and phone home last year but was ready this year and boy did he put some contacts in the log. 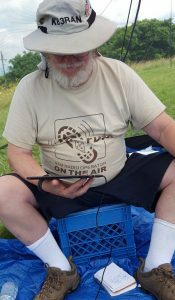 Of course you never really knew when he was working stations or just goofing off because he was always just sitting on the up-turned milk crate with the tablet in his hand looking around and chatting. LifePo4 batteries. I purchased one of these batteries days before the expedition so I hadn't had a chance to do anything except rig it with Anderson Power Poles and charge it up. Turns out, the battery lasted for around five or so hours being hooked to the D700 being run on high power for the digipeater, high power on UHF for coordination with Comers, and on the FT-857D running 25-watts on HF. When it stopped working (and boy did it stop) the voltage was a little over 8V. It had recovered a bit by the time I had gotten home but I'll call it a good day. K1. The K1's front end seemed to be overloaded from the high-RF environment that is Apple Orchard Mountain. Unfortunately, I had planned on this being my primary operating radio and so the antenna I had brought was specifically for this transceiver. Cellular phones. Up on top of the summit there is either too much competition for cellular signals or weird multipath happening. Sitting in one spot I could watch my phone go from no signal to get a 3G signal to a 4G signal to nothing all within the time-span of a minute or two. Walking to one specific location on the summit would yield a usable signal for text messaging and maybe a phone call where the rest of the summit was useless. This problem seemed to be common to all carriers. 2m weak signal. Not sure what was going on as last year that's pretty much all I worked. I've got a couple of ideas for next year including a better antenna to point at Hawksbill. One thought is to attempt a microwave link to Comers (2.4GHz, 3GHz, or 5GHz). We'll have to coordinate some on this one. Speaking of coordinating, others were apparently active on HF from their summits. 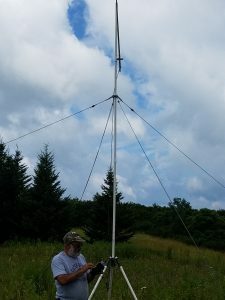 It would have been nice to know what summits were active and coordinate with them (maybe using our freshly-built APRS network) to make some SOTA contacts. Anyway, I'm excited about what 2018 will bring.